As Uel Zing transitions away from our ready-to-drink cold brew bottles, I hope to become a useful online resource for cold brew and coffee in general. It’s that time of year, so I thought I’d help out with some great coffee gift ideas for coffee nerds. I tried to think of more than the latest travel mug or pour-over cone. They’re coffee-related gifts that I actually want or maybe already own and love and am recommending for other coffee nerds. And hey, most of 'em are pretty cheap! The first ever bottles of Uel Zing Cold Brew, late 2013. Uel Zing Coffee will end our bottling operation at the end of 2017. It’s a bummer, and it may come as a surprise, but it's also a relief. After almost five years, we’ve worked really hard and learned a lot, but we’ve concluded that our high-quality hand-made single-serve beverage sold at a reasonable single-serve price point is an unsustainable equation at our scale. In other words, it’s a volume game and we just haven’t been able to hit the volume we need to make it work. We’re extremely grateful for all the support we’ve received over the years, and I’d like to explain the decision a bit more. Hi hi hi! As another holiday season rolls around, we thought we'd bring back our cocktail recipes to help you make it past the potatoes and party into the night. These are just a few basic ideas, so use them as a leaping point and get wild! Our more concentrated CONK can be ideal for some uses, but also our smaller Ready-to-Drink bottles can be the perfect touch, too. In addition to cocktails and other beverages, add our cold brew to brownies or cookies, take it savory in chili, a marinade, or heck, try basting! And please, share your creations on the internet using the hashtag #CONKoction! Pumpkin Spice Water with cold brew. In several instances, we've found that cold brewing coffee on it's own and then mixing it with whatever other infusion tastes much better than trying to brew coffee with another flavor component in the same batch. Additional components change the chemical make-up of the water and can throw off the extraction process. Written in 2015 and never before published, Head of Uel Zing R&D Austin Patterson experiments with pumpkins... well, sort of. There's the famous PSL—pumpkin spice latte—and then there's PSW, Pumpkin Spice Water. It’s fall time here in Bloomington so we got to thinking at the Lab: Let’s create a new pumpkin spice cold brew but without the heavy milk and definitely without an artificial flavoring syrup. 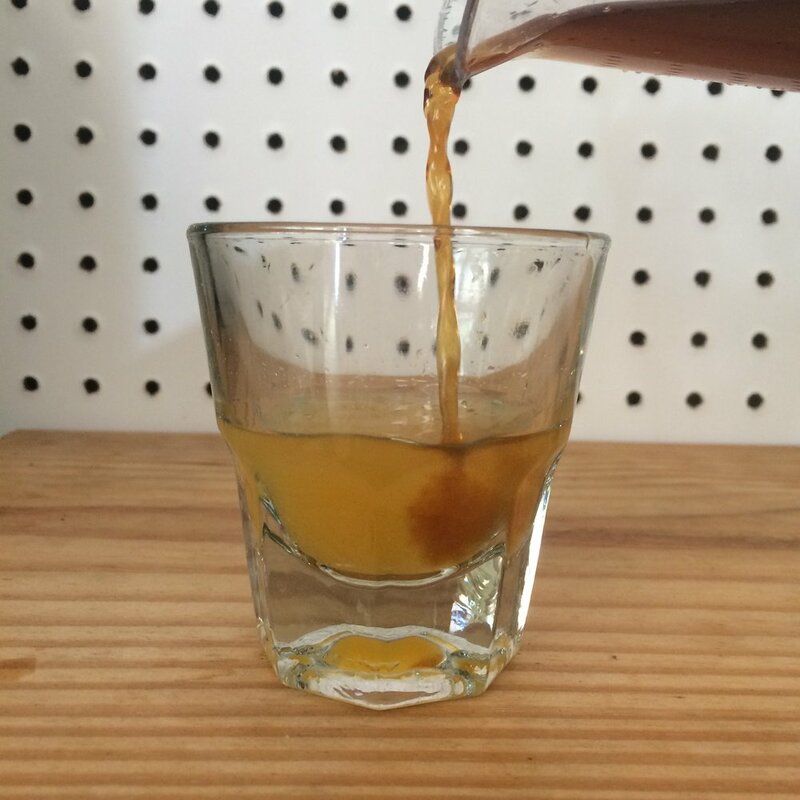 Let’s infuse our classic cold brew coffee with real pumpkin and real spice. I spent a week and a half trying all sorts of recipes and here is what I found. This month, we're launching new, smaller bottles! Why? 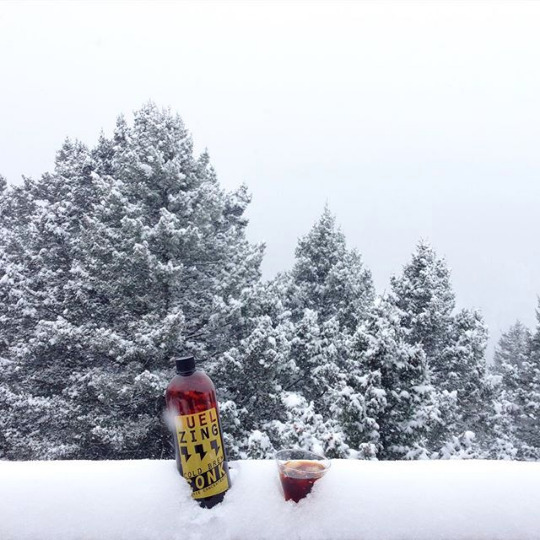 We find it's a better serving size for our super strong cold brew. And a few other reasons, too. The new 8 oz bottle is a slimmed down version of the 12 oz. It fits better in your belly, your hand, your pocket, your fanny pack, you name it. It's still an amber-colored "Boston round" bottle, BPA free, heat sealed, and full of the same great cold brew. The lid is a little smaller now, and has a pog-like cardboard seal... so grab your slammer!? During the transition, the new bottles will have a flashy yellow sticker label, but after a few weeks we'll have screen-printed bottles like usual. Cold brew, like pour-overs or espresso, is just another brewing method. We would not like to limit its possibilities by assigning too narrow of a definition. Fewer limits open the door to exciting exploration and the opportunity for discovery—all in a cup of coffee. If you are anything like us, every coffee you choose is accompanied by a feeling of anticipation and curiosity. It is an ultimate goal to assist the greater coffee community, especially those at home, to get more out of each bag that captures their attention. We wanted to take time to perform extended experiments to create a resource that aims to further our understanding of cold brew and coffee as a whole. What follows is meant to be a starting point for us and hopefully for you as well; Enjoy! The Aeropress has quickly become one of the most popular manual brewing systems out there. It has gained such a following that now there are yearly regional, national, and worldwide Aeropress championships. The Aeropress’s popularity is largely due to its incredible versatility: it can brew anything from a super strong shot that approaches espresso to a standard full cup of coffee, and anywhere in between. Its brew dynamics incorporate the paper filter of a pour-over, the full-immersion steeping chamber of a French press, and the pressure of espresso (albeit not nearly the 9 bars you get from a pump). This allows you to brew a single coffee dozens of different ways with the same tool. Drink & learn coffee—book here! We've been hosting monthly cuppings on and off since the beginning of Uel Zing, drinking and learning about great coffee. A "cupping" is the industry standard to taste and compare coffees, simply brewing coffee in a cup, sans filter, smelling and slurping from a spoon. Our cuppings are fun, low-key, interactive classes that last about an hour, and include a Counter Culture flavor wheel, and all the coffee you can handle. Due to popular demand, we now pre-book the 16 available spots online, here. Read on for the full description! 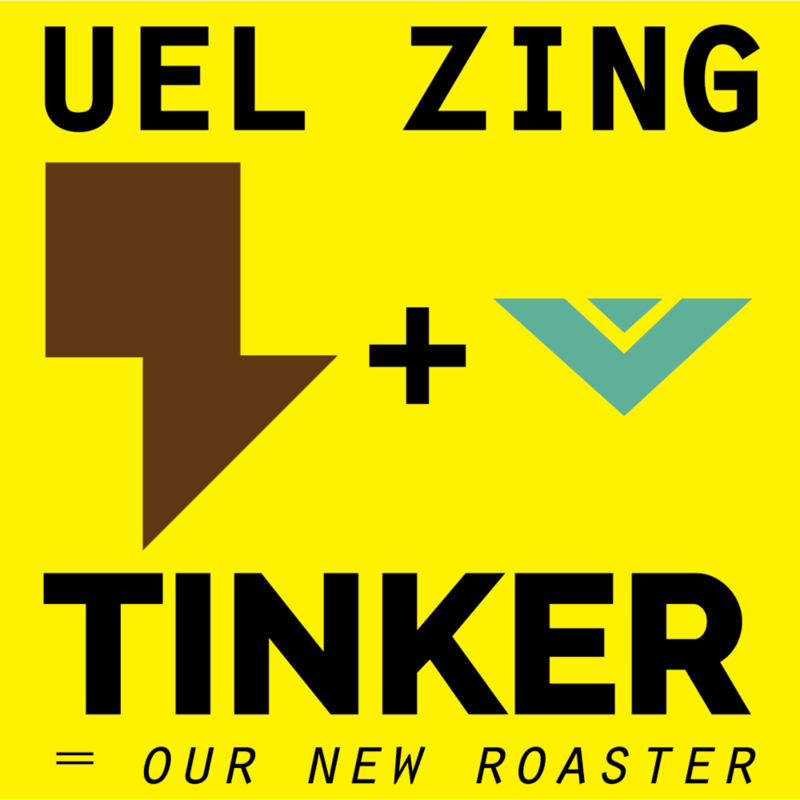 Launching March 15, all Uel Zing cold brew coffee will be roasted by Tinker Coffee Co. Our signature blend of chocolatey Nicaraguan beans, berry-sweet Ethiopian, and smoky Sumatran will remain the same, now roasted Tinker-style on a Probat L-12 gas-fired drum roaster in Indianapolis, Indiana. We have loved working with Quarrymen Coffee Roasting Co. for the last three years, and now we're excited for our future with Tinker. On Saturday, March 12, Tinker will be coming down to Bloomington for a "Meet the Roaster" event, at which we'll have plenty of coffee to taste, answer any/all questions, and maybe even hold a 1 lb sample-roaster roast off: their Quest M3 versus our own DIY Austinbilt Inferno! It wasn't long ago that we explained our weird weekend hours. Well, after writing that, and thinking some more, and explaining the schedule awkwardly again and again, we decided to make the big jump to being open SEVEN DAYS A WEEK! We looked at the busiest times according to our Square stats and tailored the hours around that. We always have a 9am surge and then again around 1pm. We're definitely an after-lunch pick-me-up to a lot of folks. So we went with 9am to 2pm. Hailing from the north—Minneapolis, Minnesota—Spyhouse Coffee is our Rotating Roaster for the month of January. I've enjoyed espresso and pour-overs in their shop when visiting my brother there, and actually, they're the only place where I've had a pour-over brewed on the Kalita Wave. Here in Indiana, I miss the cold snowy winters of growing up in South Dakota (well, nostalgically, anyway), so I figured a Minneapolis roaster seemed appropriate for January. What's up with our Coffee Lab hours??? The Uel Zing Coffee Lab is open Friday through Monday (and was closed for a healthy holiday break). ...so yeah, our hours are kinda weird. Here's why: though we began as a cold brew coffee cart, we soon started bottling cold brew—which quickly became the bulk of our business. So even though the Lab or cart might not always be open, there are about 15 other locations around town (grocery stores, donut stores, bagel stores, etc.) that are open and serving our cold brew. The Lab functions firstly as company headquarters (mainly, storing a lot of bottles) and secondly as a retail and event space: serving coffee, selling coffee beans and brew gear, hosting cuppings and coffee education, and other events like comedy or ping pong. The ZINGteam decided to head to our favorite land of fake forests and large plastic holiday figurines—Menards... and FUN ensued! Check out the full spread of UEL LOG crewneck sweatshirts, hand-knit 100% wool ZINGhats (by Lindsay), and the Uel Brew 1000 romping through a winter wonderland! And just click here to shop for any and all of these goodies! Lindsay and Penguins! Austin here, R&D Specialist at Uel Zing Coffee Lab. I recently heard a talk by UK Barista Champion, Maxwell Collonna-Dashwood, about how the water you use to brew coffee has an incredibly large effect on the actual flavor of your cup of coffee. He even has a new book on it, Water for Coffee. Turns out, using fancy artisanal and/or filtered waters doesn’t guarantee that you are using the best water to make your coffee. I already tend to be a bit skeptical of those pricey artisan waters from Europe or some tropical Island, and I figured my filtered water at home suited my coffee and me just fine. But after hearing Collonna-Dashwood's talk, I decided set up a little experiment at the Lab to see just how big of a difference water makes! This is the video that got me excited about water. It's 16 minutes but really interesting! You might find yourself looking for gifts this time of year, and I can recommend a few ideas for the coffee geeks, nerds, and snobs on your shopping list. Several of these are things that we sell at our Coffee Lab in Bloomington and/or online, and some are through other coffee sites—Espresso Parts and Whole Latte Love are great to shop around on, and of course Amazon has a lot too. There are many coffee gift guides (be sure to check out Sprudge's gift guides), but hopefully these will be some low- to mid-level price points that will score big with your favorite coffee drinker! Uel Zing Coffee Lab opened January 31, 2015. We got into the space in November 2014 and spent three months building out the place DIY style: puzzled-together insulation, lots of painting, and woodwork furniture. The Lab was actually our second shop, the first being a little pop-up the previous fall. 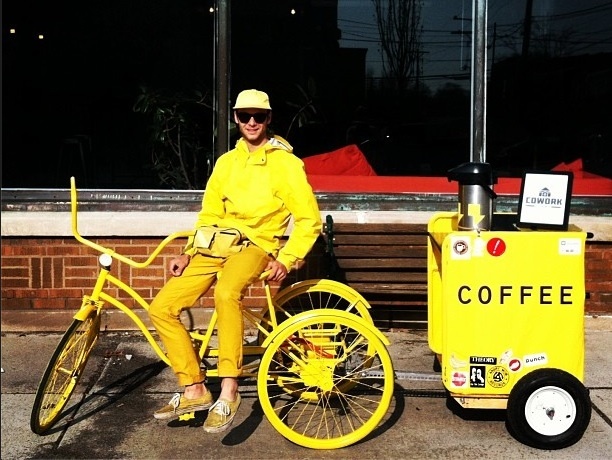 Yes, I always wanted a coffee shop, but it was actually a slippery slope to get there. 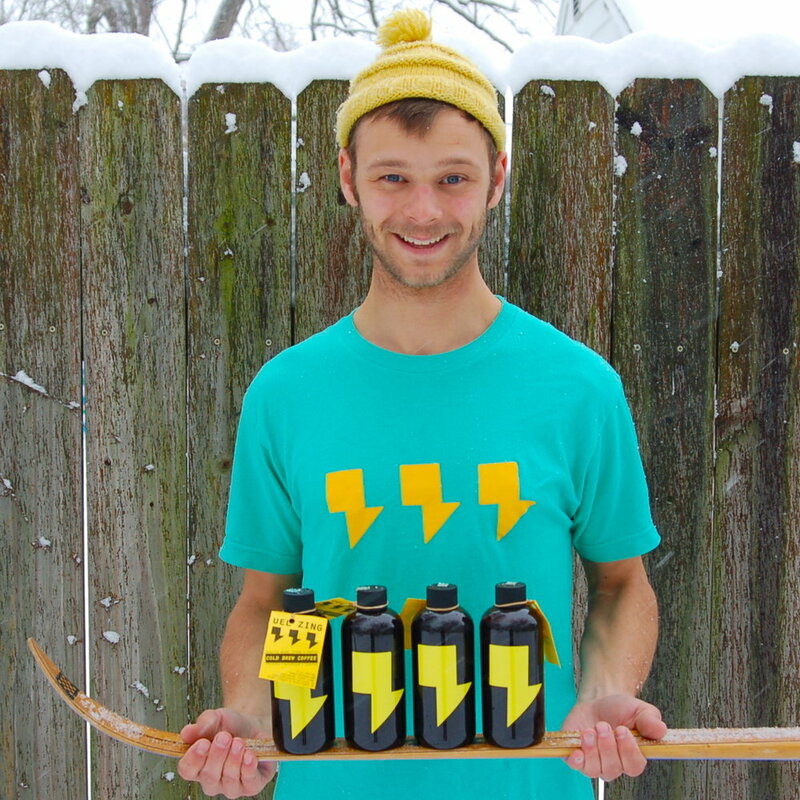 I started Uel Zing with a mobile coffee cart in 2013 and started bottling our cold brew over the first winter. And when you get custom printed bottles, you order them by the thousand, so pretty soon our home's porch was nothing but boxes. So I needed storage... here comes the slippery slope: If I had storage, I'd like an office, if I have an office and am there 9-5, I might as well sell coffee. Once we found the perfect space (basically one criteria: cheap), we fixed it up and voila! Our FUNKY LITTLE SHACK! Many people ask us how to start a food cart, so here is a page to help you start the entrepreneurial journey—at least in Bloomington, Indiana. There are basically two permits to get, but they require several other things, and it's best to get the ball rolling on as many different parts as you can. To get a business permit, you need a health permit, to get a health permit you need a commissary kitchen, to get that you need insurance, and so on. Here is the basic order in which I did it, working backwards with the first thing to do at the bottom of the page, because usually to get one thing, you need the previous thing.